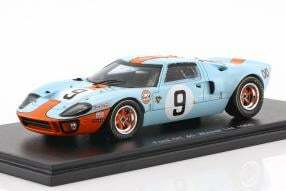 The small series label CMR released, with the model of the Ford GT40, the overall winner of the 24 Hours of Le Mans in 1968 in scale 1:12. Mexico-based Pedro Rodríguez and Lucien Bianchi from Belgium drove the Ford V8-powered prototype with 4,9 liters of capacity and the starter #9 to the top of the podium after 331 laps in front of 350,000 fans. Spark has just released this model with the reference to the 50th anniversary of this legendary victory under the article number 43LM68 now in format 1:43. In addition to this really successful miniature, the Asians had gone a long way and looked deep into the archives of motorsport to give the fans new incentives to expand their collections. We selected our highlights from it. Let's stay with our darling of the day: The Ford GT40 #9 was used by John Wyer's Team J. W. Automotive Engineering Ltd. and had more than 4,452.88 kilometers on the clock after the race; on average, the racing car was 185.536 kilometers per hour fast. 54 vehicles had started. Drivers and team bosses would certainly have enjoyed the Spark modelcar from high-quality resin plastic, which exactly matches the appearance of the glorious role model. With its approximately ten centimeters in length, it looks more like a small car against the version in 1:12 with 33.86 centimeters, but in the execution of its details, the smaller modelcar is in no way inferior to the larger one and scores with the same wealth of precisely executed details, like the miniatures in 1:12 or 1:18. And what has Spark to offer beyond that? Great names from the Formula 1 for example: Nigel Mansell's Lotus 87 from the season in 1981 in the decoration of the Las Vegas Grand Prix, the legendary gold-black of the John Player Team Lotus, therefore (1:43, S5358). 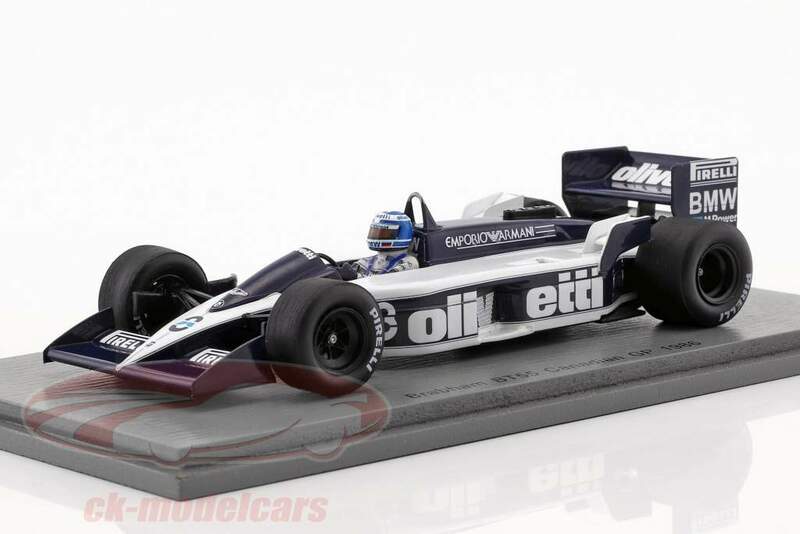 Or the ultimate hip-hop flask of 1986, the Brabham BT55 with a small Derek Warwick at the wheel (1:43, S4351). Under the leadership of Gordon Murray, the Brabham Racing Organization team developed a race car that was 80 centimeters lower in height than its predecessor BT54; in length, he extended it by 40. However, also in the oil temperature, which was 30 to 50 percent higher and thus significantly contributed to the increased wear and the associated unreliability of the engine, which alone should have lost 300 hp due to cooling problems. 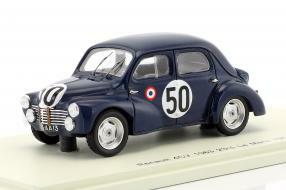 A microcar in Le Mans? The ultra-flat design: on fast tracks such as the Hockenheimring, Monza and Austria, the BT55 was one of the fastest cars. In Zeltweg in 1986 he drove 344 kilometers per hour fast, the highest measured speed there. 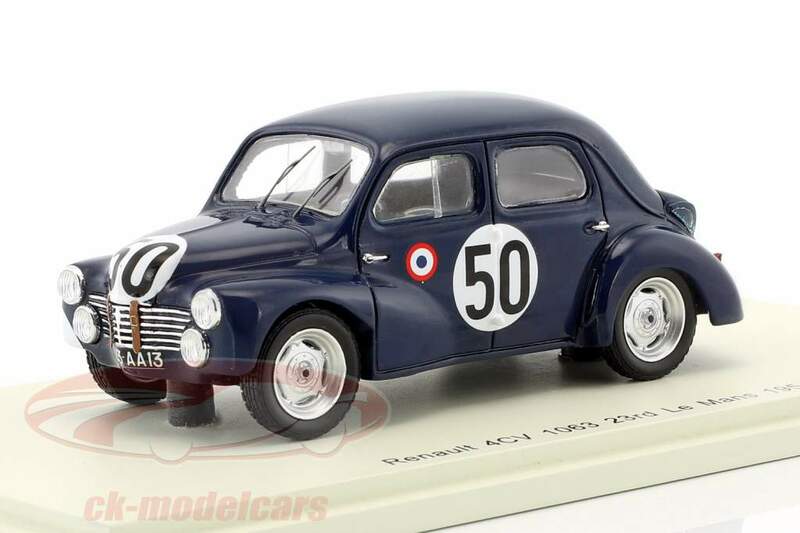 To compete with a car, the size of a Renault 4CV 1063 at the 24 Hours of Le Mans seems funny from today's point of view, but the modelcars of the class 750cc show that it was normal in 1951: Francois Landon and André Briat raced for Team Renault 22nd overall; Overall winner was a Jaguar XK 120C. 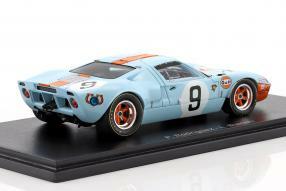 A wealth of novelties that appeal to the fans of motorsport.